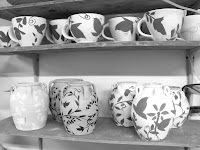 Painting the pots can be a meditative process after decisions have been made about the mode and the palette have been decided on. Maybe trance would best describe the state I'm in when I'm sitting there with my brushes, slip and bisque ware. Last night I had a thought to try(again) to get a watercolor effect on some of the pots. 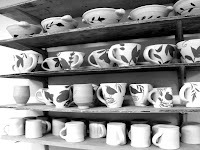 Usually the underglaze gets absorbed into the glaze and the effect is lost or obscured. If anything it was a good exercise. With the birthday party and the mounting pressure just before this firing, I was feeling a little stiff or should I say the painting /brushwork was a little stiff. 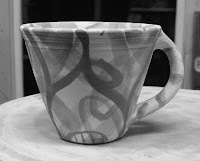 An unfortunate impulse during the painting yesterday caused me to have to remix my black underglaze. I had some vague memory of reading or hearing from someone about additives to slips to ease the flow when painting on bisque. In case you haven't painted bisque ware, or aren't a potter, (there just may be a few non potters reading this, welcome to tech talk) the thickness of the slip is very important. 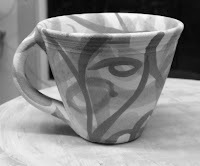 The thinner the slip/underglaze is the easier it is to paint. Unfortunately the thinner the material the less opaque the color. So by adding an agent to help slip flow helps the painting without sacrificing (too much) the density of the slip. Now that I've thoroughly confused everyone...I decided to add a little liquid laundry soap that I have around to prime my brushes for the wax resist. (another story) The slip went from a very heavy cream consistency to very watery. I had deflocculated the slip!!! AAGGHH, Oh Noooo. Well I thought about it for a moment. OK, the soap is alkaline and in order to get it back to a working consistency and I need to add an acid. So I reach for my vinegar, (a must have in the pottery studio) and dropped a teeny bit into the slip container and voila it thickened right up! It's a Rock Creek white slip and made a small bucket's worth. The materials are equal parts so it makes for easy mixing. The #6 Tile I guesstimated. 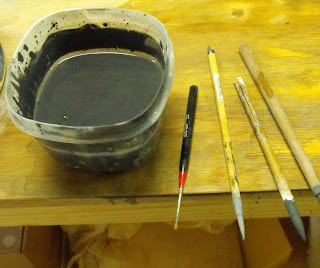 The I mix in enough black Mason stain to make the mixture pretty dark. I would guess that I used about 1/4 lb #6650 (cobalt free) mason stain. I them use my trusted electric salad dressing blender (hand held) and mix the slip and the stain until smooth. I add water when necessary. Here's picture of the container so you can see the color. I guess it's about 20% Mason stain. Off I go up the muddy path to pottery-ville. Have a good day/night!